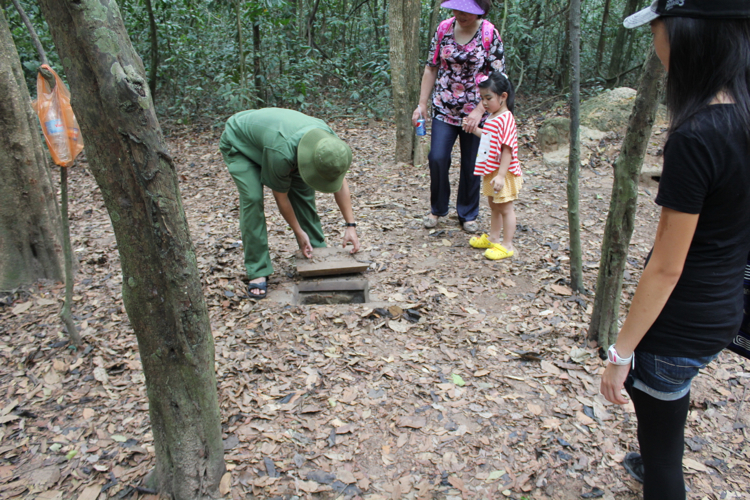 The Cu Chi Tunnels are a massive network of underground tunnels and chambers in the Cu Chi district of Ho Chi Minh City (formerly Saigon), and are part of a much larger network of tunnels that linked Viet Cong support bases over 250 km, from the outskirts of Saigon all the way to the Cambodian border during the Vietnam war. If you spend some time exploring Ho Chi Minh City on foot, you will likely see one travel agency after another, and more so if you’re staying near Pham Ngu Lao (the backpacker street). 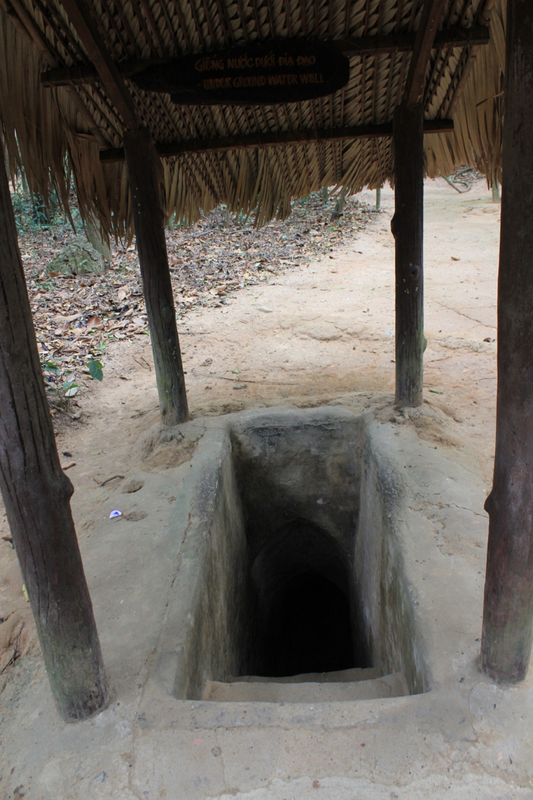 Booking a tour to the Cu Chi Tunnels is pretty simple and inexpensive. 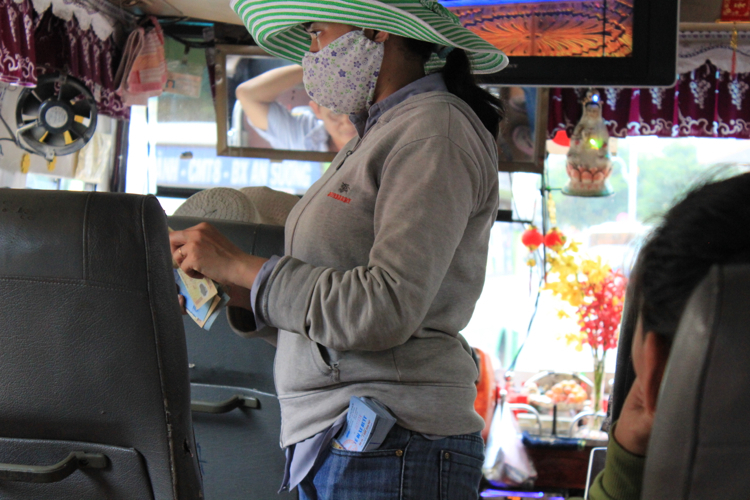 The lowest price we’ve seen a half-day tour for was 100,000 dong, or about $5 CAD. Note that this does not include the tunnel entrance fee of 90,000 dong ($4.50 CAD). 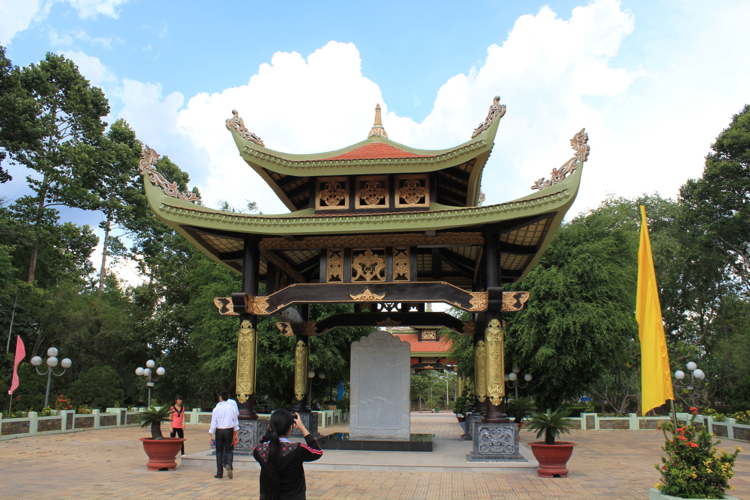 The half-day tour generally picks you up at 8:00 am, take you to the tunnels, and then returns you to Ho Chi Minh City around 2:00 pm. You can opt to be dropped off at the travel agency storefront, or at the War Remnants Museum, where you will have to find your own way onward. 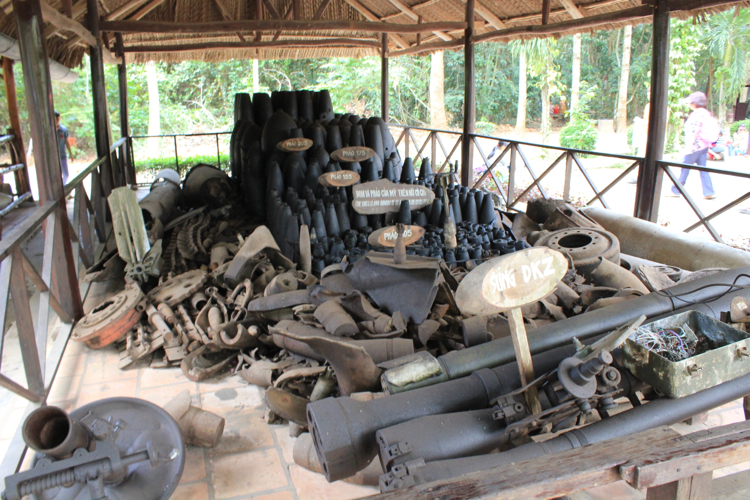 The War Remnants Museum isn’t too far from the city core, so it’s not too much of an inconvenience. Another option is to do the trip yourself by taking the local busses. This is what we did because we wanted to check out the public busses, and we wanted to go to the Ben Duoc tunnels, while most (or all) tour companies take you to the Ben Dinh tunnels. 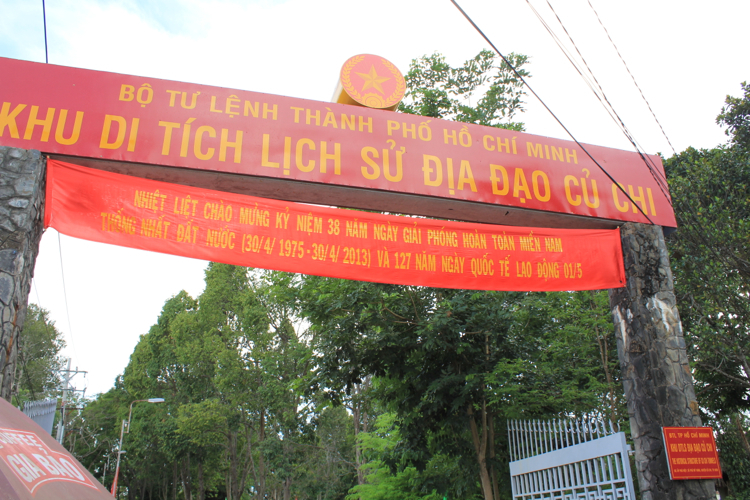 The difference between Ben Dinh and Ben Duoc is that the tunnel sections at Ben Dinh were specifically created for tourists and were never part of the real tunnel network, partially because most tourists are built slightly larger than the average Vietnamese person. 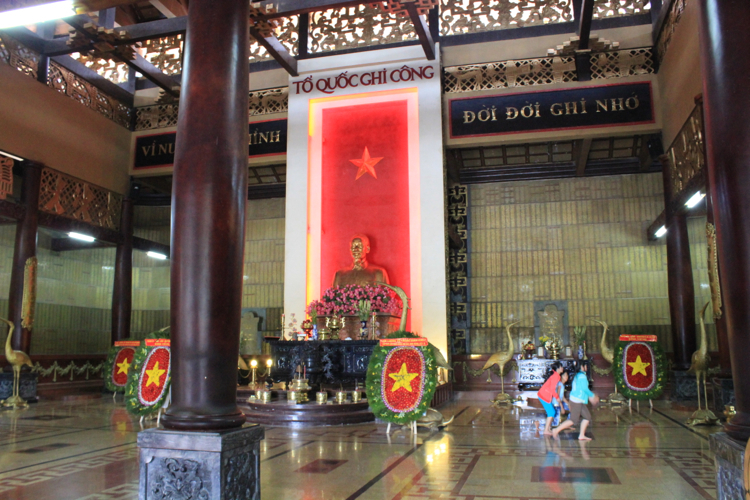 Ben Duoc is where all the Vietnamese locals go, is further out from Ho Chi Minh City compared to Ben Dinh, and was actually part of the real network of tunnels. 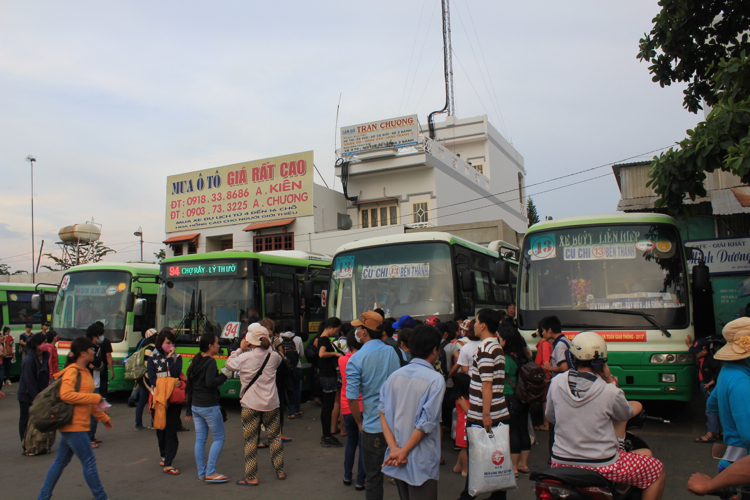 Go to the Ben Thanh bus station. 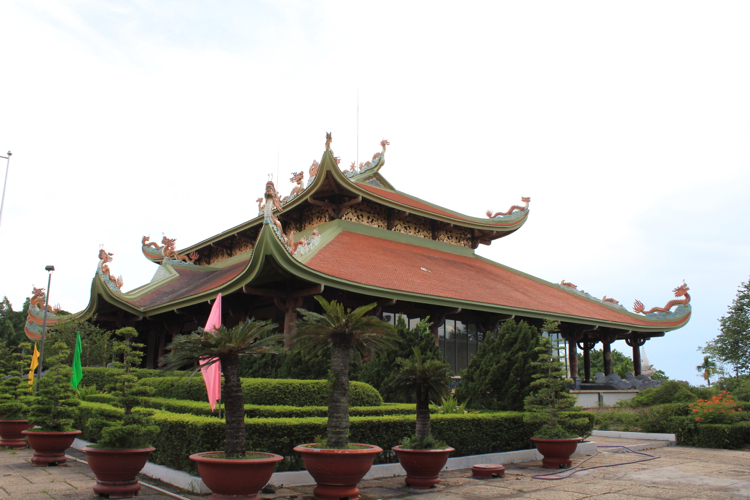 It is opposite the Ben Thanh market. Hop on bus #13 to Cu Chi station (end of the line). 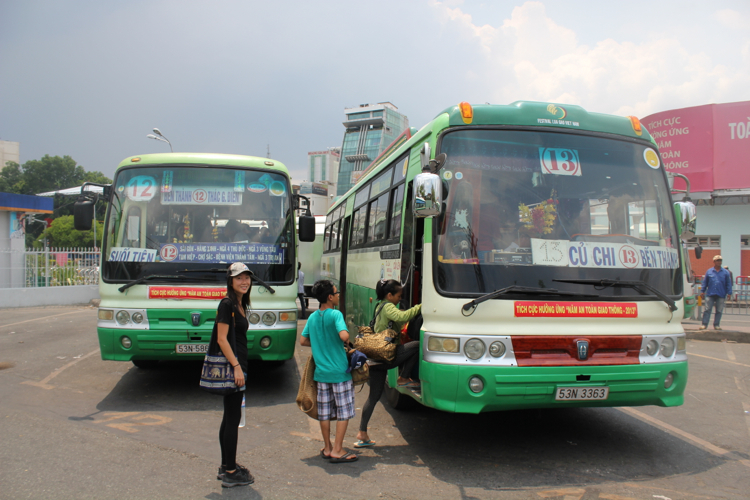 The Ben Thanh bus station is no longer served by bus 13. Instead, hop on bus 88 at Ben Thanh and jump off at the next stop. This will take you to park 24/9, which serves as the new end station for bus 13! 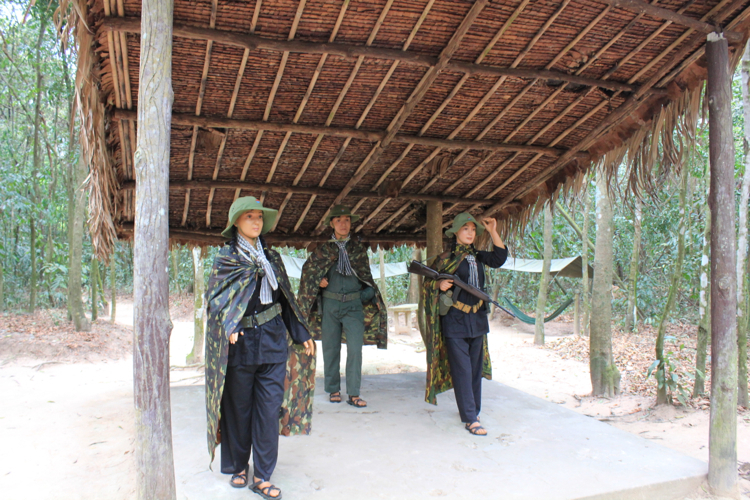 Please do leave a comment if you have successfully reached the Cu Chi Tunnels with this new bus route. The fare should be 7,000 dong / person ($0.34 CAD). Just get on the bus and take a seat, a ticket agent will come around and sell tickets to everyone. He/she will have a stack of change, so you don’t need to worry too much about having exact change. There will also be vendors trying to sell you snacks or drinks. Some get off before the bus takes off, while some will stay on the bus, but they won’t keep pestering you. The bus is comfortable and has AC. There was a TV at the front playing “Celebrity Dancing”, or Vietnamese Dancing with the Stars. I can’t guarantee that you’ll get to see Celebrity Dancing on your trip however 😉 This ride took us about 1.5 hours. 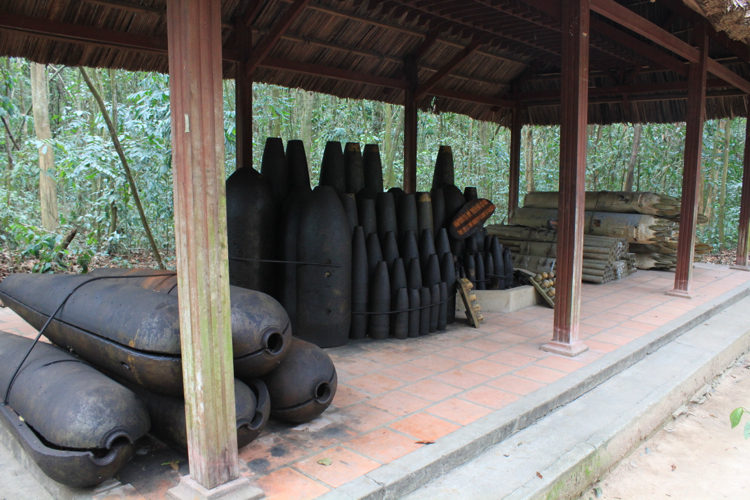 At Cu Chi station, ignore all touts offering to take you to the tunnels. They will be waiting right outside the bus as you get off. 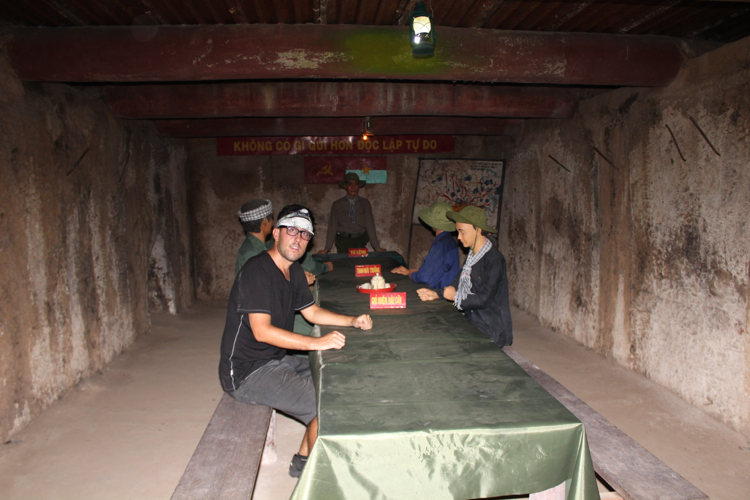 We met two guys who agreed to pay $7 USD for a round trip from Cu Chi station to the Ben Duoc tunnels, and this was after they had bargained it down from whatever the starting price was. On bus #79, you could either pay very close attention to the road, or ask the driver to notify you to get off at the right stop. This bus had weaker AC, and the ride was about 50 minutes. 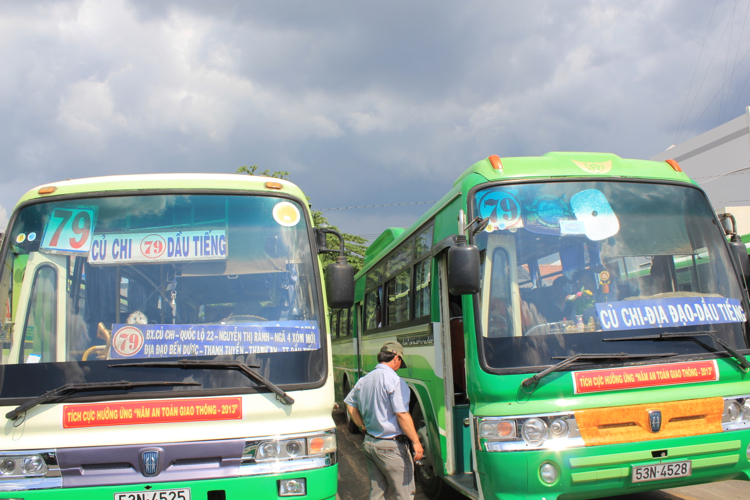 If you sit near the front of the bus, you will see that you eventually come to a T-intersection in the roads, where a large blue sign will point to Ben Dinh to the right, and Ben Duoc to the left. If you want to go to Ben Dinh, you would get off at this T-intersection and walk the rest of the way, or stay on the bus to go to Ben Duoc. The map below is intended to provide a rough idea of the distance between Ho Chi Minh City and the tunnels. Google maps has not been most reliable with the exact location of the tunnels. 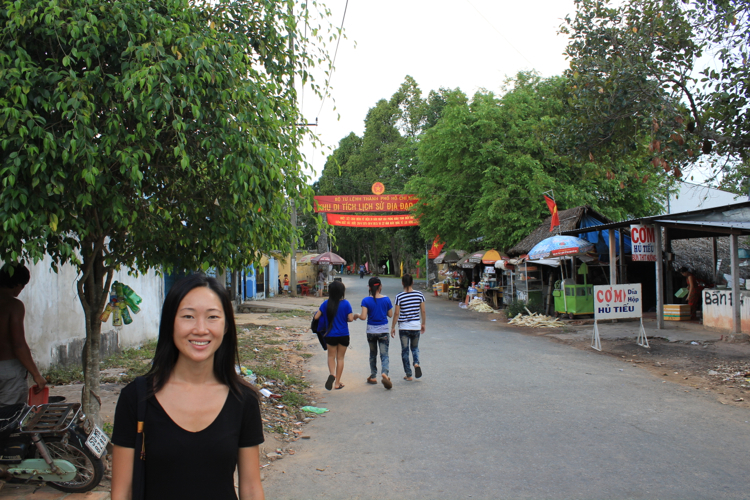 A is Ben Thanh Market in Ho Chi Minh City, B is Ben Dinh, and C is Ben Duoc. This map also does not show the route taken by the bus. When we first got on bus #79, we asked “Benh Duoc?” several times to make sure we were on the right bus, both to the driver and the ticket agent. 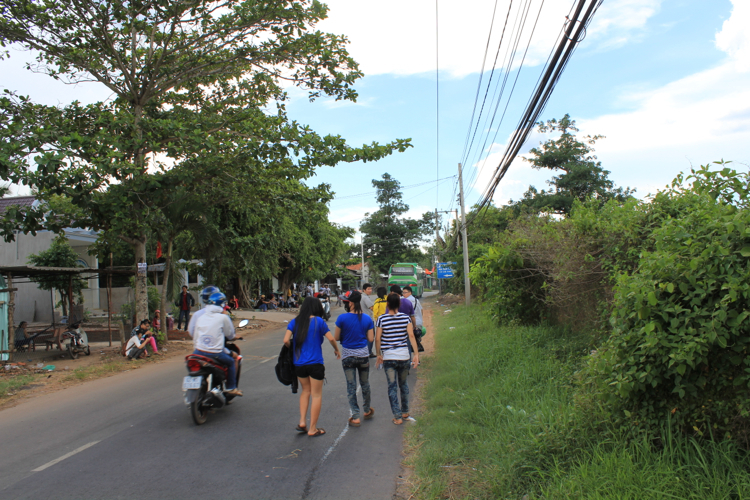 There were also other Vietnamese locals who were trying to get to Benh Duoc and did not know which stop they needed. 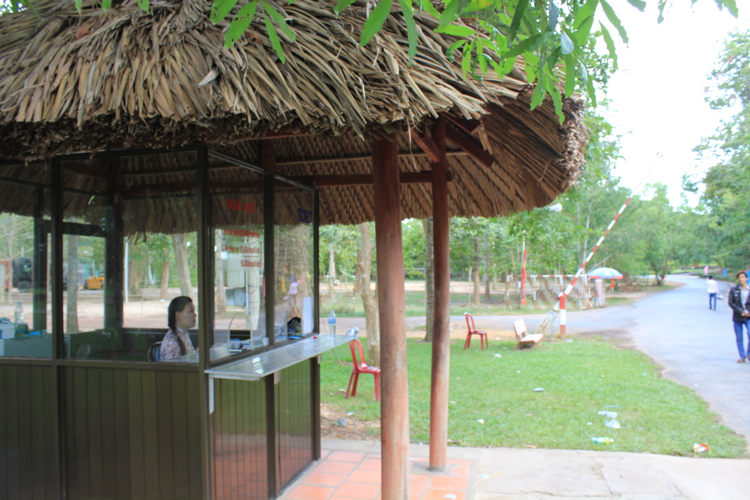 The ticket agent waved at us and signalled to get off the bus when we arrived just outside of the entrance to Benh Duoc. The entrance fee is 90,000 dong ($4.40 CAD), made up of two different tickets. One of them was 70,000 dong ($3.40 CAD), and the other 20,000 dong ($1 CAD). We tried asking what the two tickets were for, but didn’t really get a proper answer. It seemed like you needed both to get in anyway. 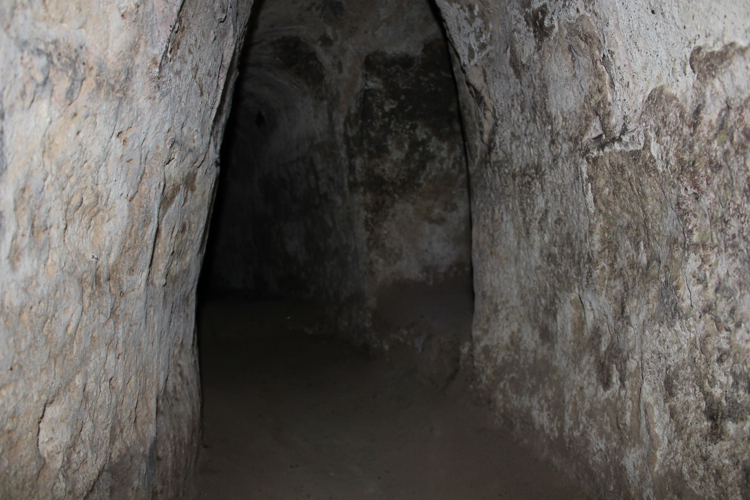 Aside from the tunnels, there were a few other structures worth taking a quick look at. 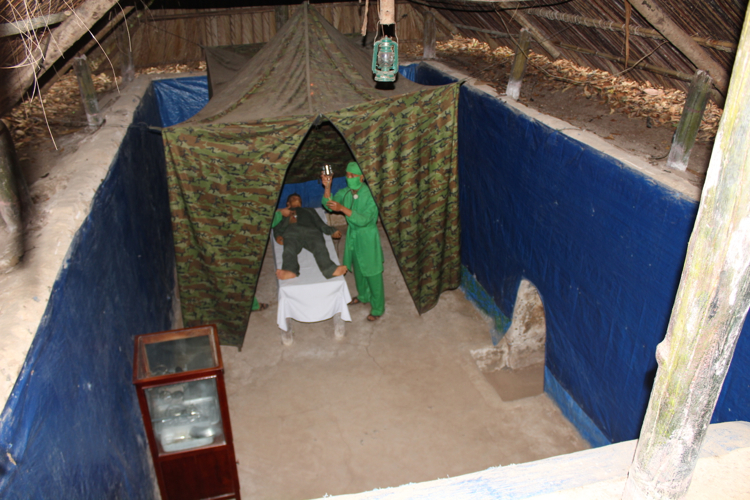 A tour guide is included in the entrance fee. Adam and I were milling around the beginning of the tunnels, checking out the displays of American bombs and weaponry left behind, when we were approached by somebody in uniform asking if we’ve had a tour yet. The guide was friendly enough with a sense of humour, and good English skills. But as we were previously warned, they do tend to rush you through the tour. If you want to take a bit more time, just hang back or make the request nicely. They will oblige. We were joined by a family of Taiwanese tourists and were on our way, starting with a display of the uniforms worn, followed by more American bombs and artillery. We were minding our own business when the Americans bombed us. 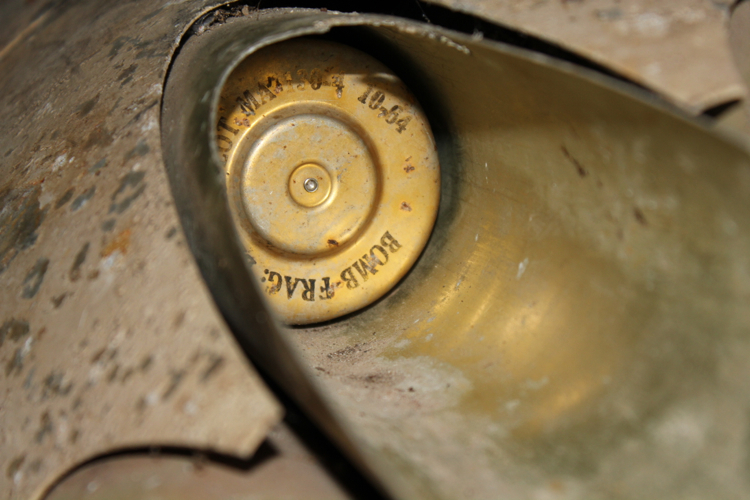 They bombed our women, our children, our old and weak, our pots and pans. What the heck?? So we fought back like champs. We modified our simple farming skills that were once used to trap animals, and we reclaimed our land. At the entrance of each tunnel segment, our guide alerted us that if we do not feel comfortable going in, or if we were claustrophobic, or had any health issues, we were encouraged to wait at the exit while the rest of the group went in. Each segment was quite short, so it wouldn’t be too long of a wait for those who could not go in. 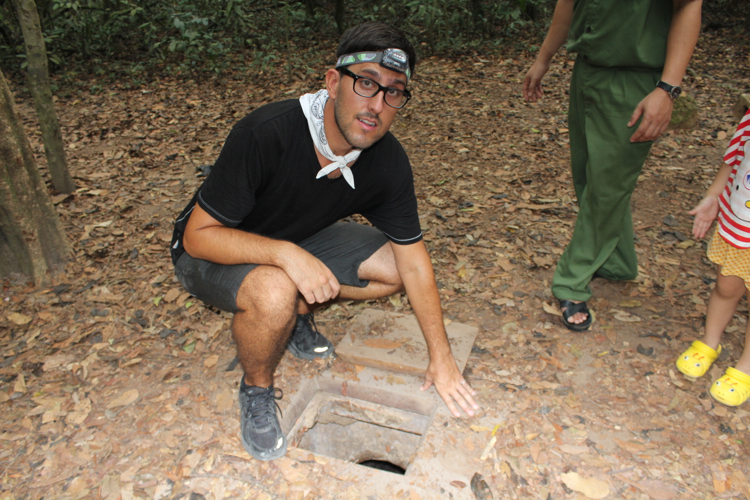 We were a little concerned about whether Adam could fit into these tunnels, seeing as how Ben Duoc was frequented by Vietnamese locals as opposed to foreigners. Our guide joked that Adam was just as wide as he was, just taller, so it would be fine. The tunnel entrances have been dug bigger, and the tunnels themselves have been re-enforced by concrete for tourism and safety purposes. Putting on my headlamp. The guide carries a flashlight, so you don’t really need one. 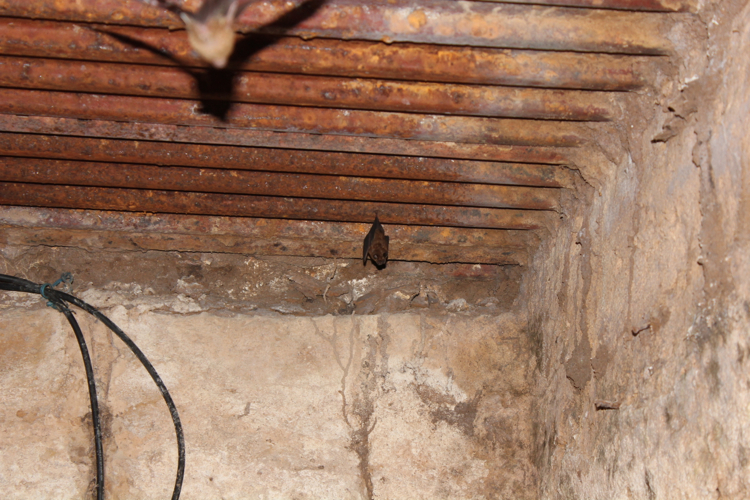 By the way, there were bats, and it’s highly possible that they have rabies. 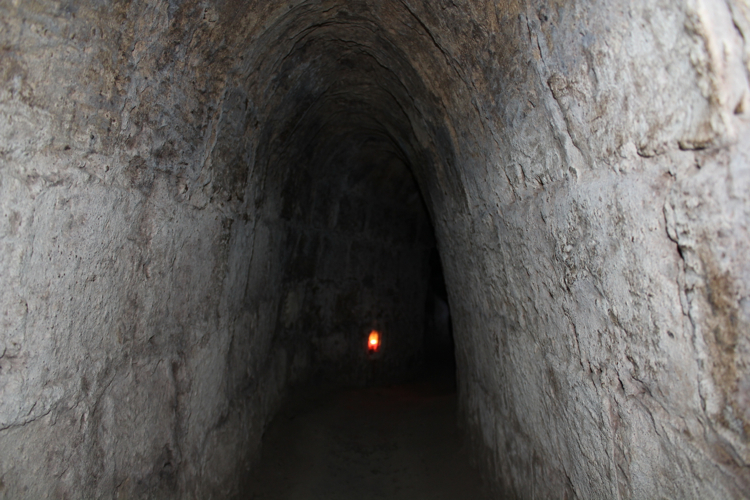 They would fly by while we crawled through the narrow tunnels, so they can get quite close. 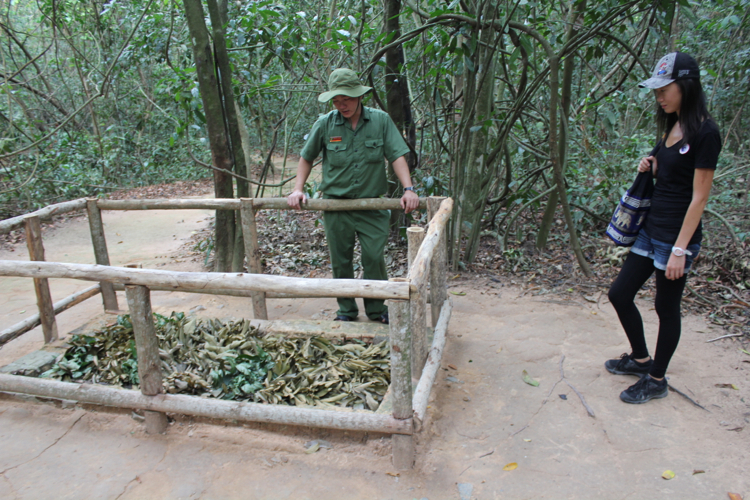 During the tour, we were shown several methods the Vietnamese used to avoid detection. 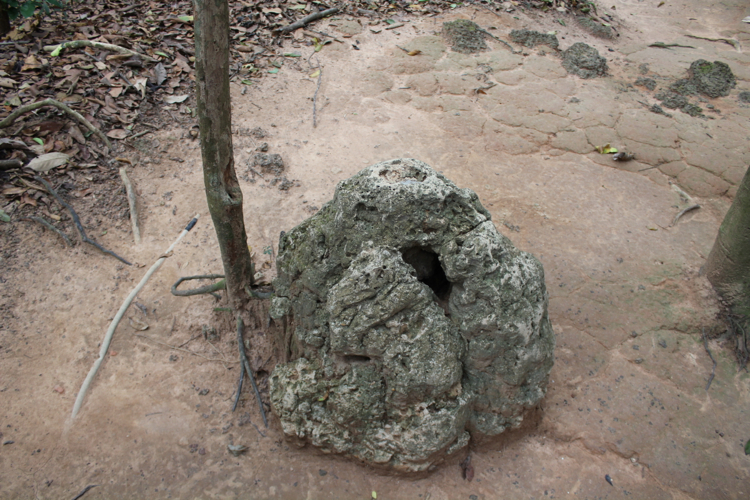 Innocent looking (fake) termite mound that lets air into the tunnels. 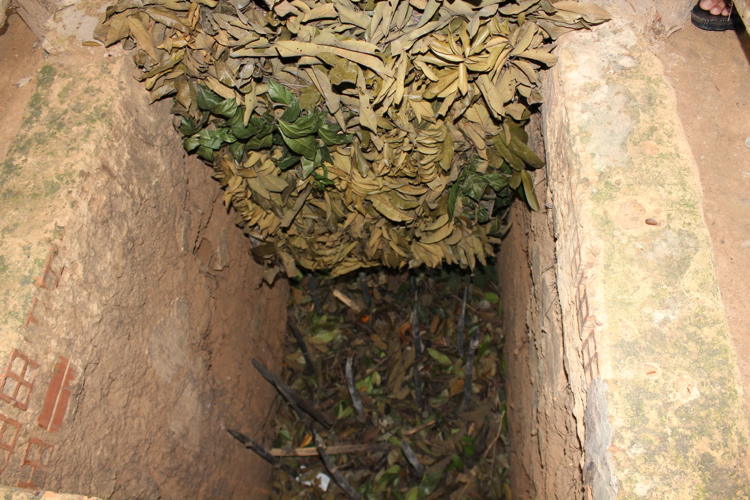 Ground up chilies would be smeared on it so that the dogs would not approach it and pick up the scent of humans. 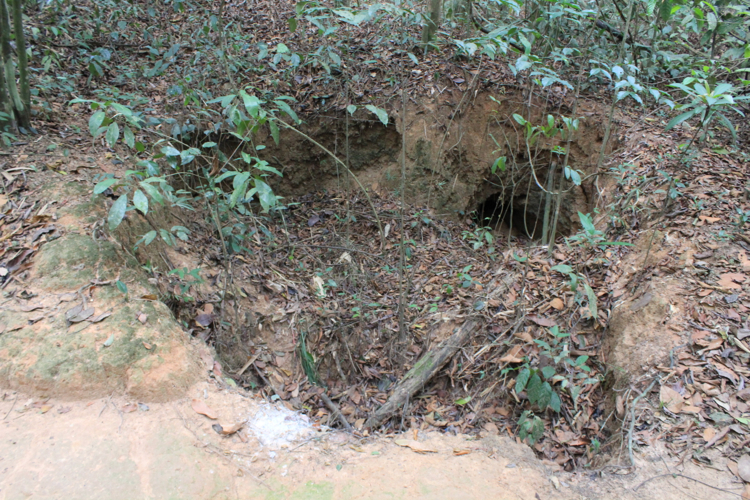 A camouflaged bunker mound, allowing for lookouts and sniper attacks. 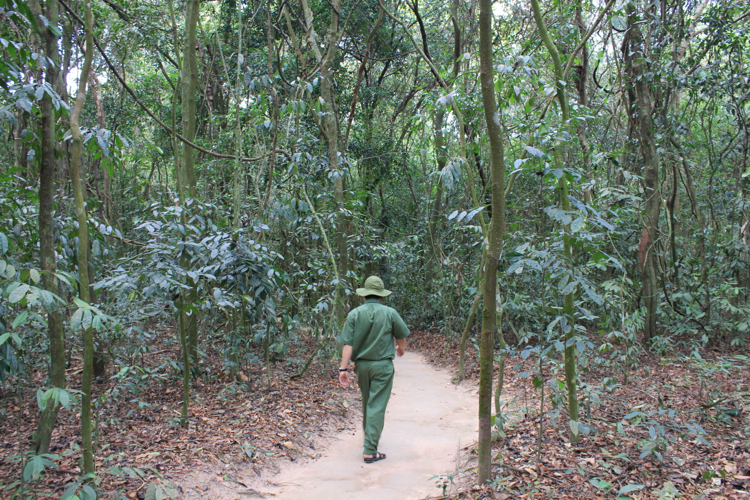 It looks kind of obvious in the picture, but imagine you were in an uncleared jungle without a tour guide. Plate of cassava (?) roots with a bowl of sugar. 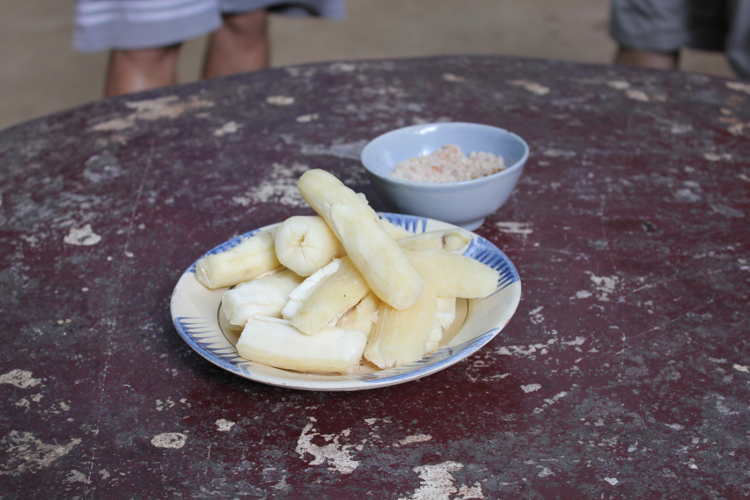 One of the simple foods the Vietnamese had while living underground. And that concludes the tour! Once the guide takes off, you’re still free to wander around the grounds. 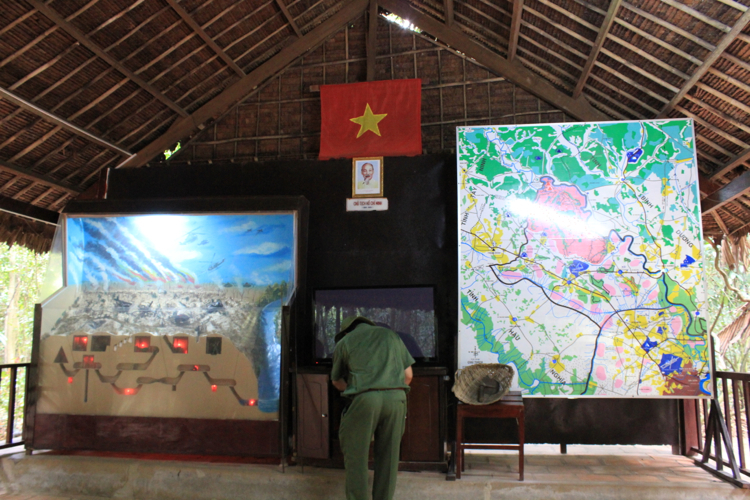 There were several other displays of weapons, photos showing Vietnamese war heroes, explanatory diagrams, more examples of booby traps, and of course, souvenir shops. Note that bus #79 stops running at 5:30 pm. Seeing as how we didn’t get to Ben Duoc until 3:20 pm (we started our trip at 1:00 pm), we were watching the time closely. If need be, we would’ve had to hire a motorbike back to Cu Chi station at an inflated-desparation-rate, but luckily we got on what may have been the last bus of the day. 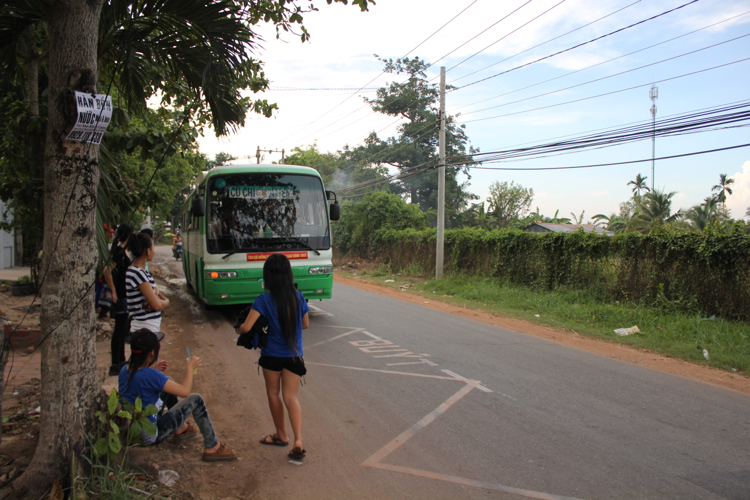 We got on bus #79 at 4:40 pm, and arrived at Cu Chi station at 5:35 pm. 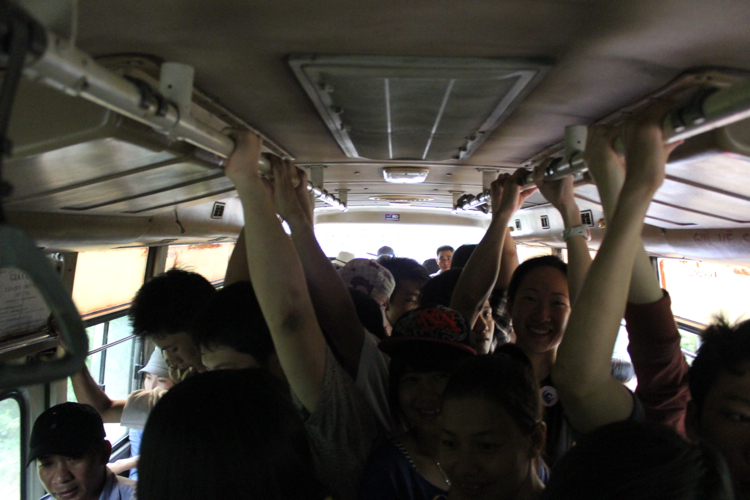 The bus was quite full to start off with, but we shoved ourselves on regardless. 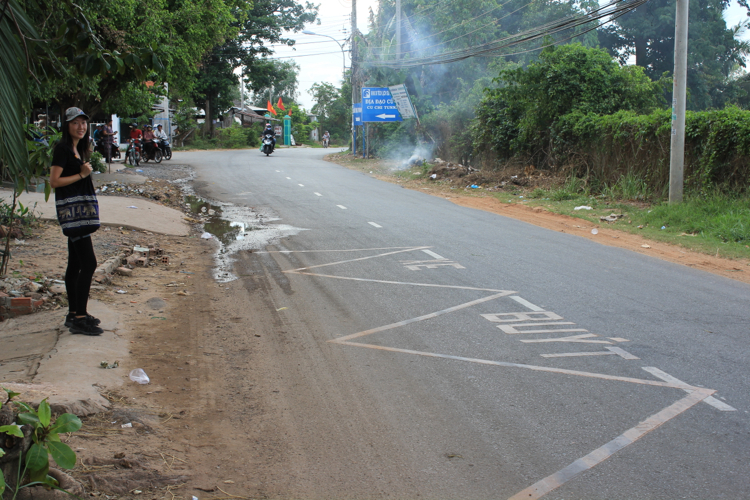 We did not want to be at the mercy of a motorbike driver if that was in fact the last bus of the day. Adam and I eventually got separated as more people got on. One little Vietnamese guy (I get to call him little because he was shorter than me :p) shamelessly rested his head on my shoulder and proceeded to take a nap. I can’t complain though, because Adam had three little Vietnamese guys sleeping on him at the other end of the bus. And yes, we were both standing the entire time, as were these men sleeping on us. We would suggest not leaving so late in the day as we have done, because we had likely met up with rush hour. 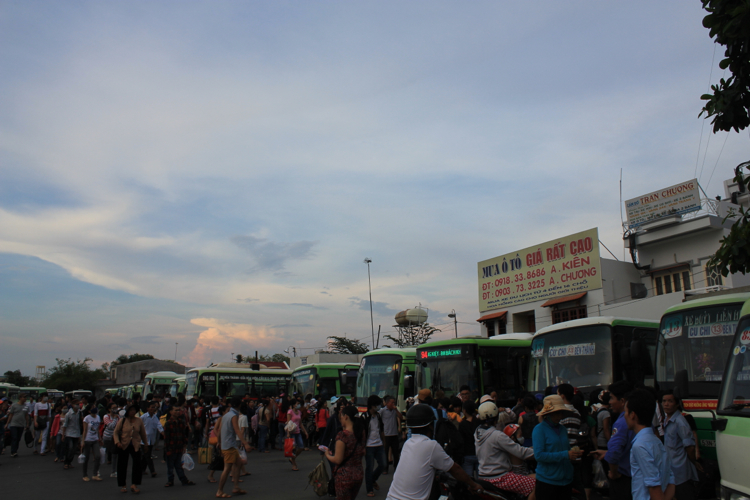 At Cu Chi station, we watched two fully loaded bus #13s leave before we could get on the third one. We could’ve shoved our way onto those busses, but we really didn’t want to stand for another 1.5 hours. We eventually caught on with what the smart people did, and waited in the tiny bit of space in between busses to get in from the back door. The third bus #13 backed in, and we ended up standing right in front of the back door. An older Vietnamese gentleman smiled at us for standing in the perfect spot. When the bus was ready to open its doors, he signalled for us to get ready to jump in. That was very much appreciated as lots of pushing and shoving ensued. Hop on bus #13. 7,000 dong. 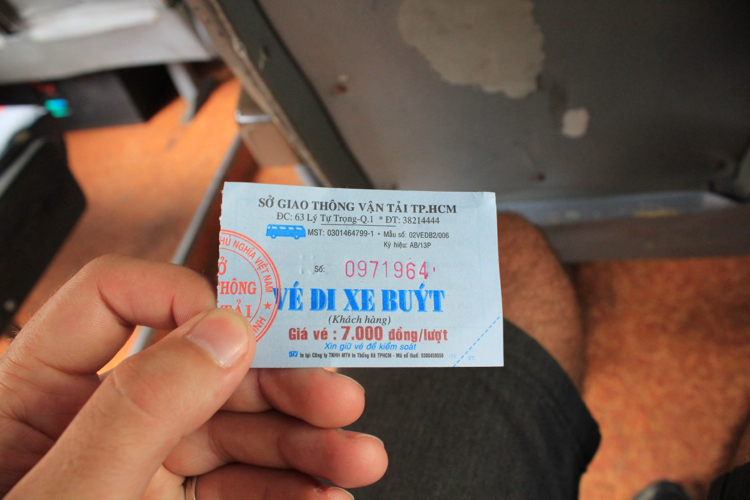 1.5 hour bus ride to the Cu Chi bus station. 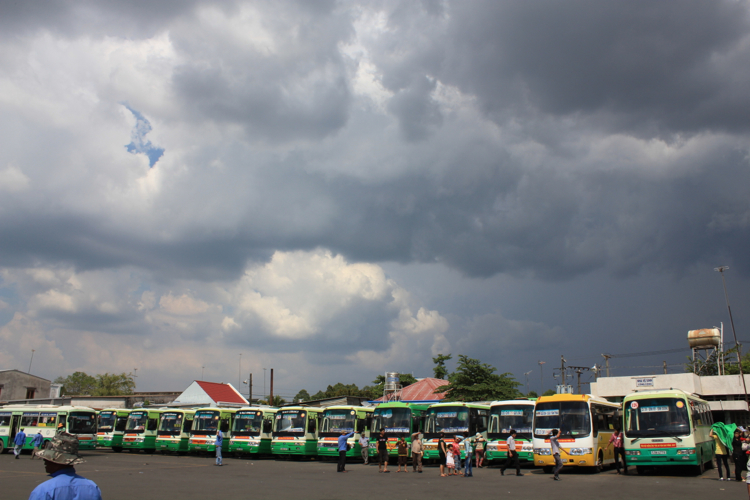 Update Dec 2, 2013: Ben Thanh station is no longer serviced by bus #13. Instead, hop on bus #88 and get off at the next stop. This will take you to park 24/9, which is the new end station for bus #13. Hop on bus #79. 6,000 dong. 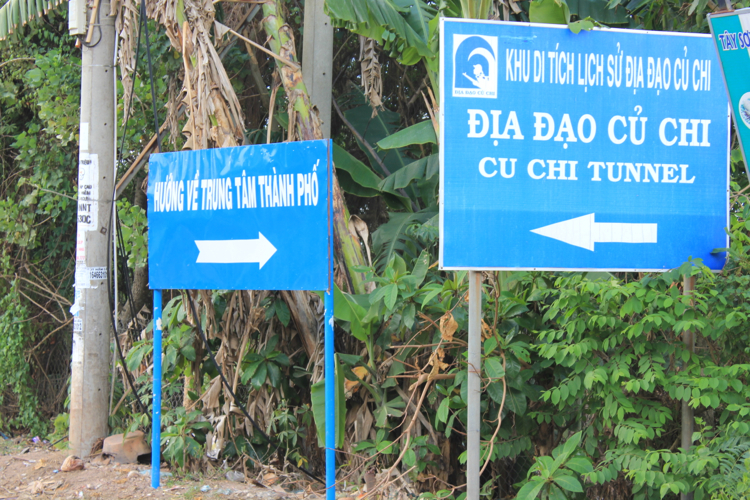 Request the driver or ticket agent to flag you for the Ben Dinh (right of the T-intersection, tourist tunnels) or Ben Duoc (left of the T-intersection) stop. About 50 minutes to Ben Duoc. Take bus #13 back to Ben Thanh bus station (7,000 dong). I believe this bus runs until 10:00 pm, but best to double check. Update Dec 2, 2013: Bus #13 now takes you to park 24/9, the new end station. Hop on bus #88 at park 24/9 to get back to Ben Thanh station. That looks very cool! I love your description of the Viet opinion of the war, LOL. This is definitely something I’d want to see if I went there. 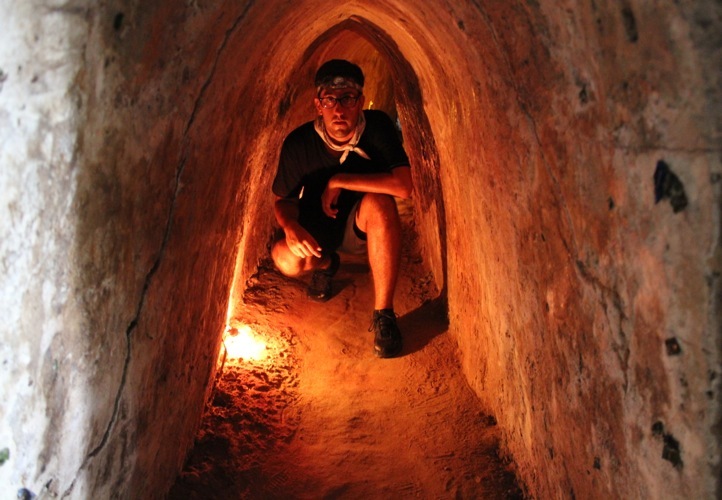 And the best part is that you went to the real tunnels, not the made-for-large-people fake ones! And if Adam can fit, that means I can too. We, a family of four (including 6 & 8 year old kids) went to Ben Duoc yesterday 18/05/2018. We took a large Pizza from Pizza hut nearby before boarding the bus. We used our travel time to have our lunch on the way. We started at 11 AM at Saigon Bus station on No. 13 and reached 1230 PM at Cu Chi bus station. The conductor in bus 79 indicated that bus will leave at 1245 in 12 minutes. There is a small provision store right outside the bus station on the left hand side. We stocked out water bottles, coke and snacks. We reached Ben Duoc stop at 1325. At Ben Duoc, it seems promotional videos are discontinued. We started our return journey at 1515. 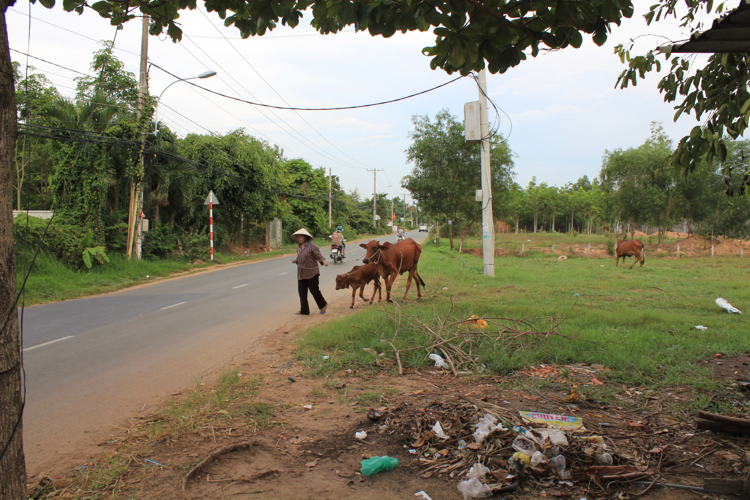 Reached Cu Chi Station at 1556. At we reached we found a no. 13 bus leaving. 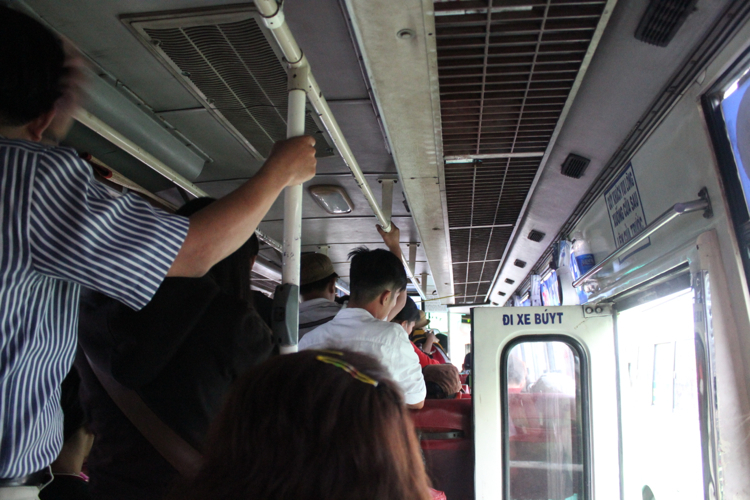 We got on board and reached Saigon bus station at 1735. 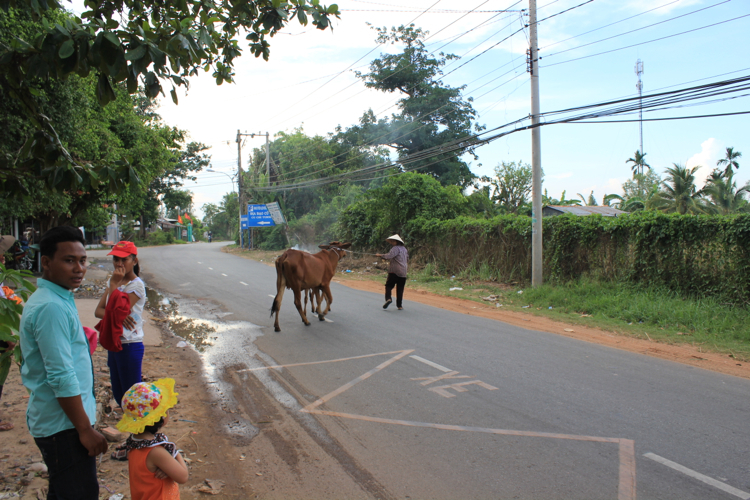 We met several locals on the way who have been very helpful and forthcoming to interact despite language barrier. Thank you for your detailed post which helped me execute this plan successfully. Awesome website thanks for everything…. You just made my day and trip a whole lot cooler!!! Thanks for the nice article.going by bus is much more adventurous and more fun.the directions in your article were accurate and easy to follow,however since a few months Ben Thanh station isn’t served anymore by bus 13.we had to go to park 24/9,which serves as new end station.you can get there easily by jumping on bus 88 on Ben Thanh station and jump of at the next stop. Hi. 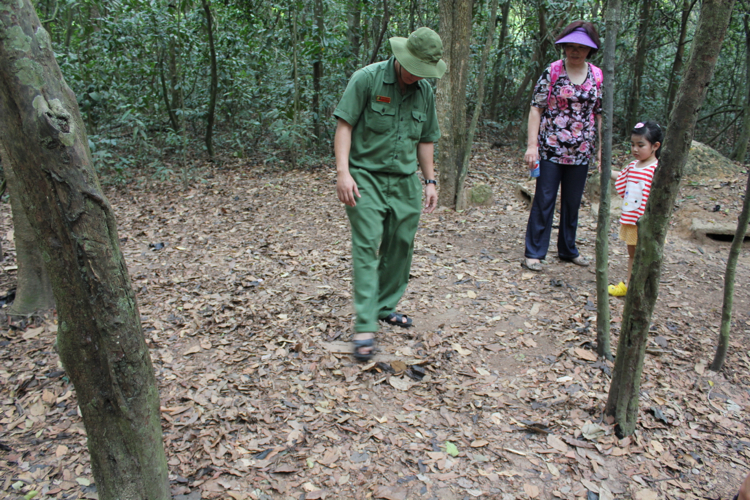 I went to the Cu Chi tunnel on the 2nd of March. I caught the bus number 13 from the bus station opposite of Thai Bin market, which is the closest bus station from ‘Cong Quynh/Pham Ngu Lao’ – the backpackers area. So no need to get to Ben Thanh station if you stay in the budget area. All other information written on this page were accurate, so thanks a lot for that. Thank you very much for the helpful article. We went today to the Ben Duoc tunnels and loved it. We took directly the bus #13 at the “Ben CV 23/9”, large bus terminal at the west end of Park 23/9 (indicated on Google Maps). It was really easy to find the place, the driver told us when we had to get off. We took the same amount of time as you did and our buses were not crowded at all (leaving HCMV at 9.15am and being back at 4.00pm). Hi Marine & Romain! Thank you VERY much for sharing your experience with us! I’m glad you guys had a good time! 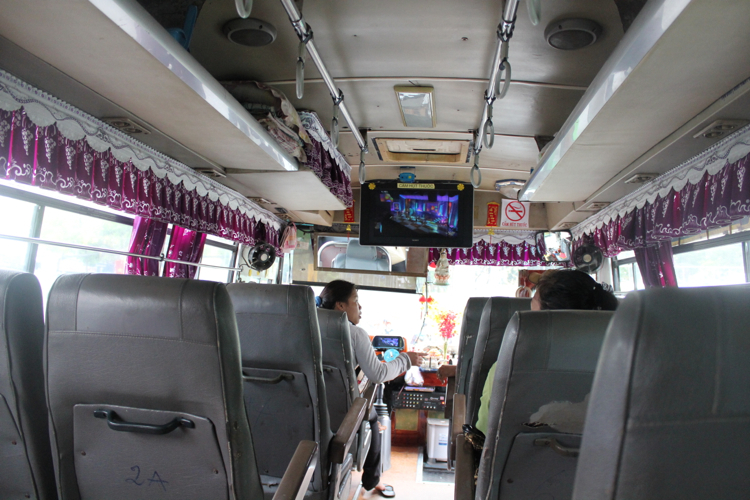 You can catch the bus number 13 on the Cách Mang Tháng Tám road, which is 5 min. by walking from the Main Buss station. BTW, dont WALK right to the Ben Dinh on the T intersection!!! It is long way to walk and the place is not authentic (it is made just for turists). Oh wow thanks for letting us know! Thank you! Worked very well for me! Good that the information was updated, as the bus indeed serves 23/9 park! Hey, thanks for the awesome blog post! We bought a Honda Win here in Saigon, used google maps to find our way up to the Ben Duoc Tunnels. The map location is accurate, and we took that route by motorbike – so it works! Awesome directions….worked perfectly. We actually got a bit lost once we entered Ben Duoc, but were able to find the ticket office eventually. Thank you for this blog. Today (16 Jun 2014) we went to Ben Duoc tunnels following your instructions! The bus station is at Park 23/9 (not 24/9) and very easy to find the bus you want. 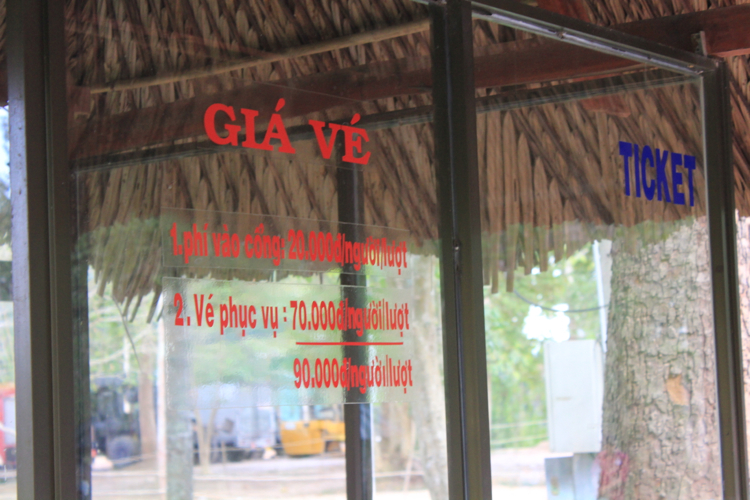 Prices are still 7000VND for #13 and 6000VND for #79. 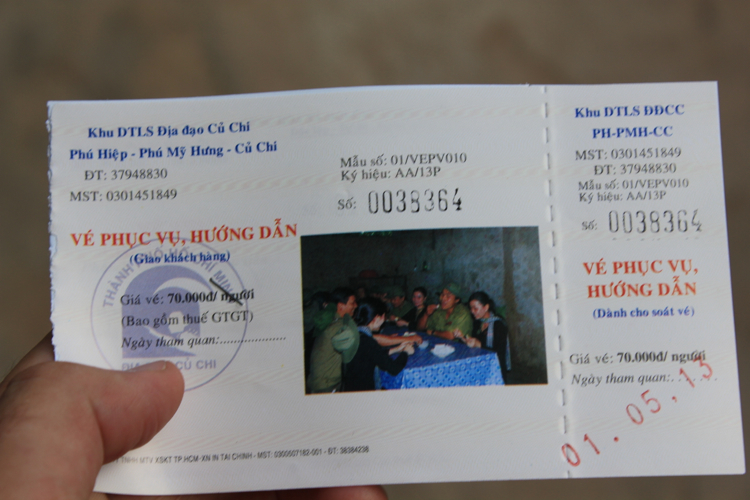 Very cheap compared to the 240000VND our hotel was asking for a 1/2 day tunnel tour. Bus 13 took 1 1/2 hours and 79 took 40 minutes. All the buses seem to run every 10minutes so there’s no waiting around. We left at 8.30am and arrived at 10:50am. 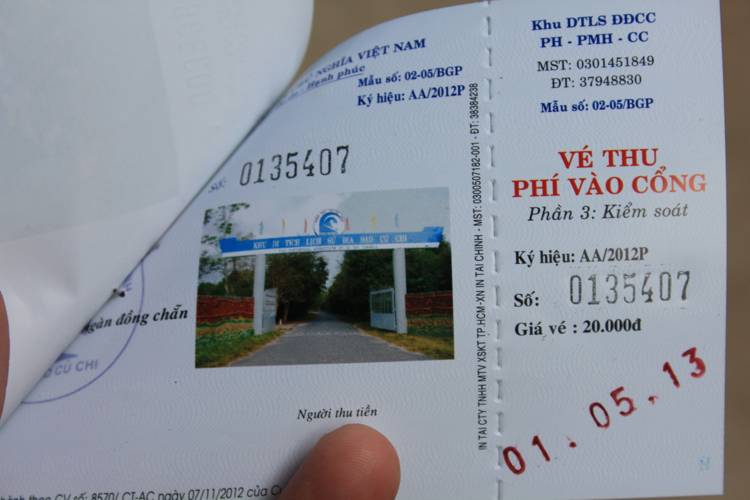 Entry price including tour still 90000VND (2tickets as you described). We had an excellent tour. 9 of us in the group including 2 children and the guide did the whole tour in English. First, thank you so much for all the details! 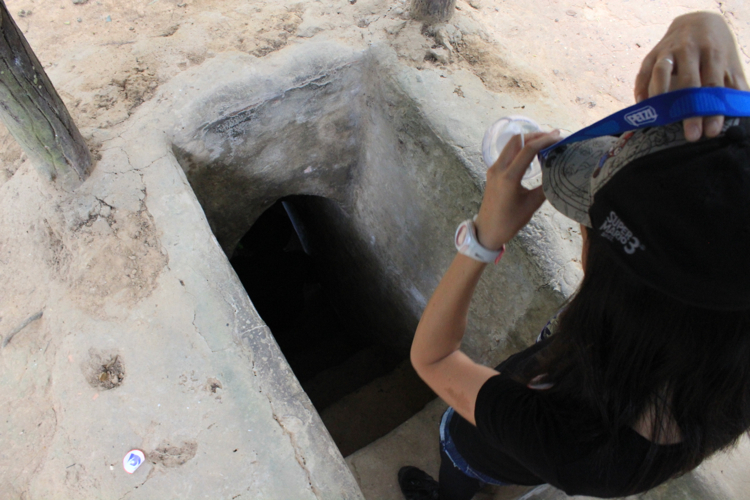 We went to Cu Chi tunnels today (November 9th 2014) at Ben Duoc tunnels. We took bus 13 to what seemed to be its terminal. 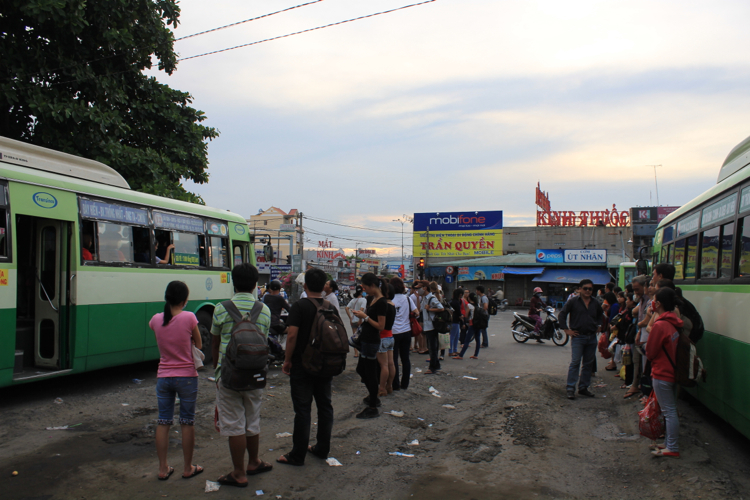 It is a huge bus station on pham ngu lao (the backpackers’ street), just before the intersection of le lai street. It is not very far from the market so it might be preferable just to walk there. The priced are the same and i figured out that the twl tickets at the site was one for the tunnels and one for the food experience at the end. Again thank you for all. I do not have much to add to the previous comments. A week ago we did the tour starting from and ending at CV 23/9. Everything went according to your suggestions, so thanks a lot for the very helpful blog. 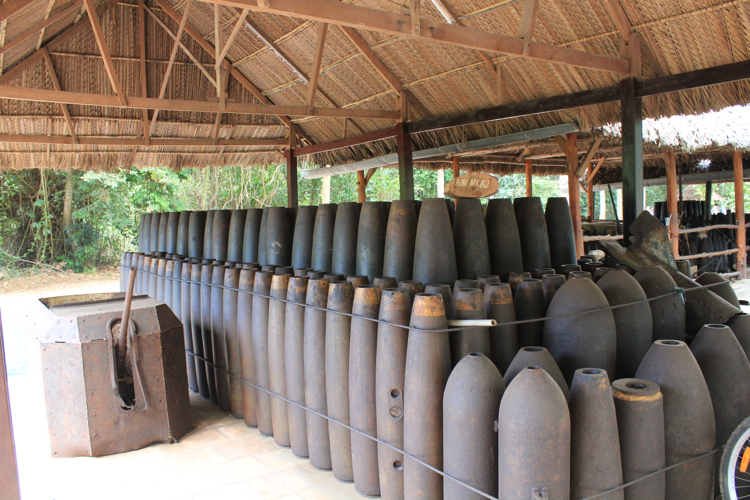 Maybe one thing to add: there is, just as at the Ben Dinh site, a shooting range (if you buy more than ten shots, they drive you there). 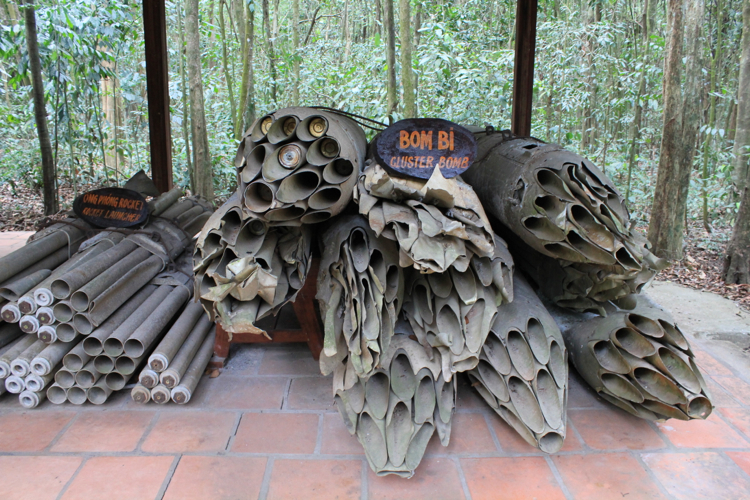 Prices are around 35000 VND per bullet. Thanks for writing this guide. We are not interested in doing a tour either and were looking for a way to get to the tunnels ourselves and this is perfect. Thanks for the detailed info! 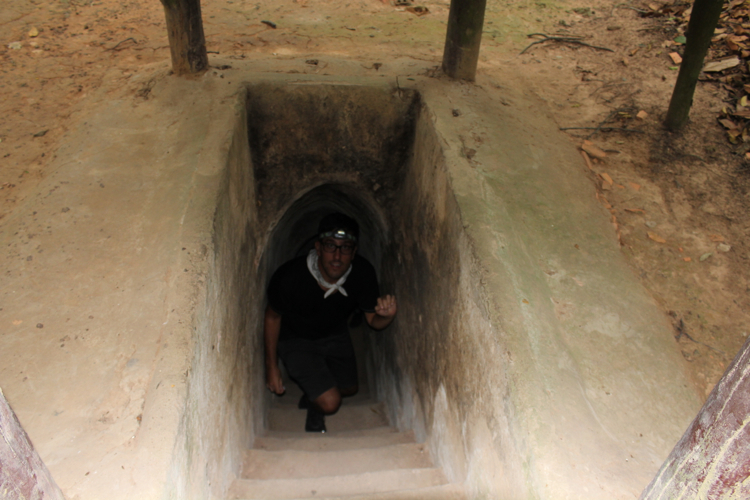 Thanks for the info, went to the Cu Chi tunnels today. It was fun and less touristy (Ben Duoc). Would like to share some updates: you can hop on the bus #13 from 23/9 or 24/9, as the bus is going to do a interchange (same number just another bus)at another bus station. And most important is the price remained unchanged. 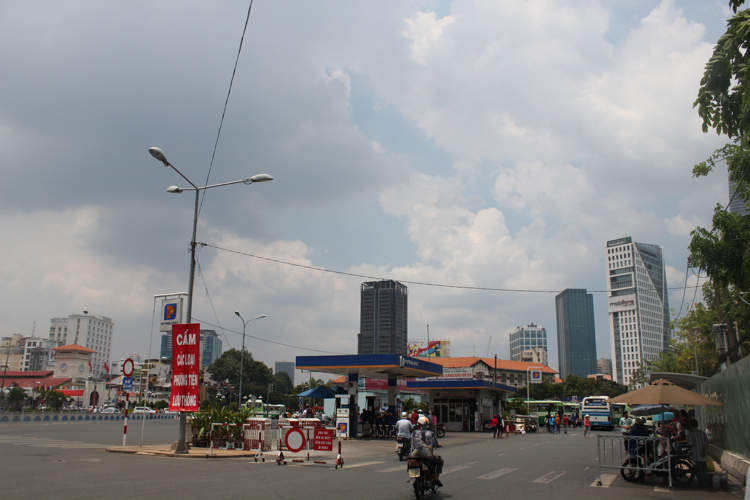 P/s: Didn’t know bout the return as we hopped off few stops before Ben Thanh bus station. Awsome post! Thank you so much! Finally! Someone who actually went to Ben Duoc with photos and a good description! Thank you! I have a few questions if you don’t mind. I’m travelling with my 70+ year old mum, and she can’t really walk long distances. We will NOT be travelling by bus, if we are to do Ben Duoc – we’ll take a cab. But even then, from your photos, there seems to be plenty of walking even with a cab dropping us at the ticket stand, right? My mum can’t really walk more than maybe 100/200 metres at a stretch! Can you please let me know how much walking there is, if the cab drops us as close as possible? Thank you so much! 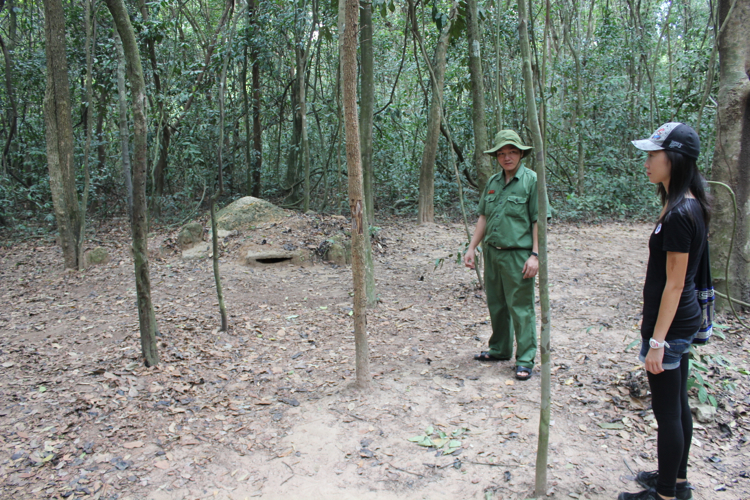 Do you know anything about the Ben Dinh tunnels? Is walking there less than at Duoc? Thanks!! Hi there! I’m very glad you found this post helpful! I do have a fuzzy recollection that there was a spot for cabs to drop people off closer, but don’t quote me on that. And although closer, there was still a bit of a walk to the tunnels. 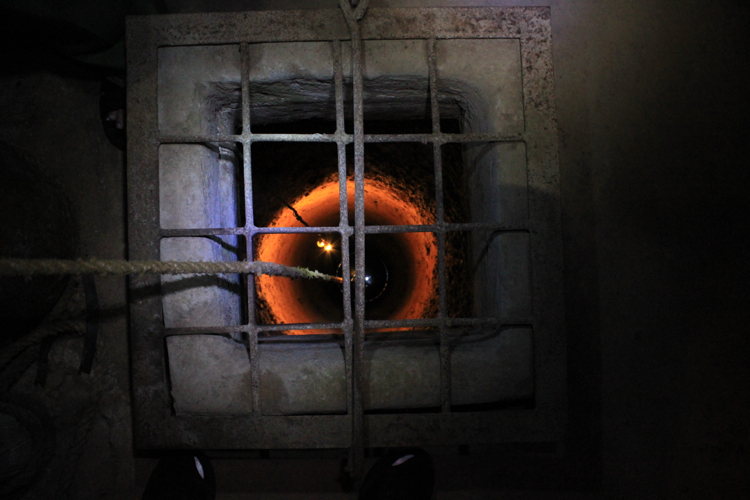 Once you reach the actual tunnels, I think there was roughly 100 metres between each tunnel (give or take). The guides also tend you rush you through the tour. They walk and talk very quickly. Perhaps if you tip them ahead of time they’ll be more willing to slow down, and maybe let you request a private tour (as opposed to group you together with other tourists that have arrived at the same time). To be perfectly honest, this might not be the greatest excursion for your mum as there is a fair amount of walking 😦 Would your mom want to go into the tunnels as well? I think that’ll ultimately be up to you and her, but the guide might advise against it. As you can see from the photos, there will be some parts where you’ll need to stoop pretty low, and there won’t be enough space for you to help her along. I’m afraid I’m not familiar with the Ben Dinh tunnels, but I would expect it to be similar or worse. Worse in terms of larger groups of tourists that will be rushed along. I hope you have a wonderful time no matter what you decide! We also did the tour by public bus yesterday and it worked pretty fine with your description. Thanks a lot for it! At Ben Duoc Tunnels, there were only maybe 15 person on the entire area with us, so definitely recommend this site. 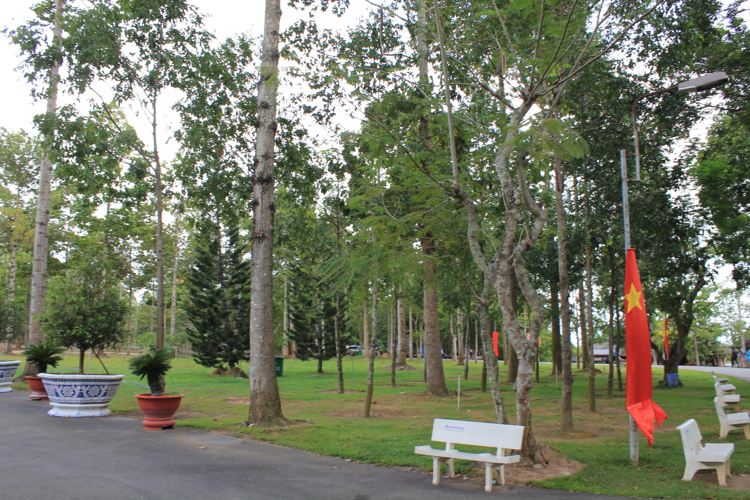 If you start at Ben Tanh Station, you can hop on Bus 39,86 & 102 to get to Cong Vien Park 23/9 (the start of Bus 13) or you just walk there. An alternative if you are close to Chinatown would be Bus Nr. 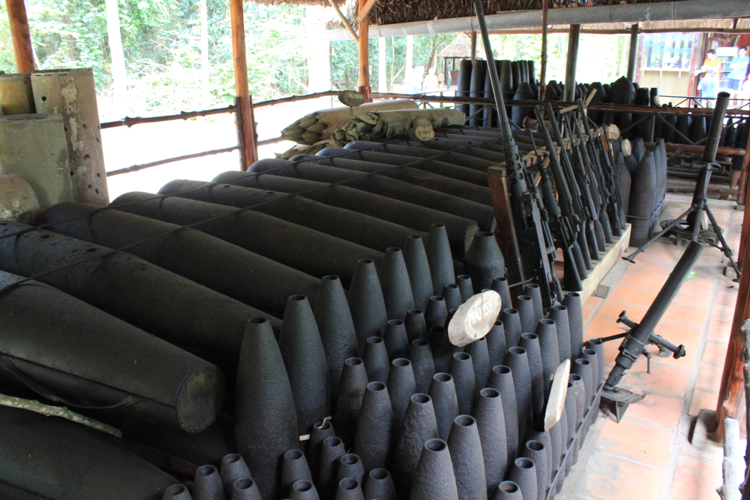 94 from Cho Lon to Cu Chi. Hi Julie, thanks so much for your description! We had a great time today (Sunday) at the Tunnels because of your description. We took bus 13 from 29/9 park and proceeded to take bus 79 to Ben Duoc (easy to take back as well). Prices were still the same as mentioned. Everything still works as described, so smooth sailing, but we also had to stand most of the way back after leaving around 15:00 We love taking public transport to interact with locals and really get a feel for daily life in Vietnam. Thanks again!